the earliest direct predecessor Jinjiang Shuyun was founded in 1740 at Chengdu Fuxue which was originated in BCE 141.
currently officially recognized establishment year is 1896, when the Sichuan Zhongxi School was founded. National Sichuan University was formed in 1931. The current Sichuan University is the result of mergers of former Sichuan University and the two other universities, Chengdu University of Science and Technology (CUST, Chinese: 成都科技大学), which is under the Ministry of Education and formerly called Engineering Institute of Chengdu (Chinese: 成都工学院), a school separated from the formal National Sichuan University in the 1950s, merged in April 1994, shortly known by the name of Sichuan Union University for the new formed university, and West China University of Medical Sciences (WCUMS, Chinese: 华西医科大学), a university under the State Ministry of Health, in September 2000. 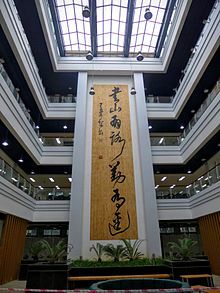 Sichuan University is one of the earliest institutions of higher education in China, with many predecessors, and became National Sichuan University in 1931 during the period of the Republic of China governing the Mainland China. The earliest predecessor of Sichuan University is Jinjiang Shuyuan (Jinjiang Academy, 錦江書院) established in 1740 at Chengdu Fuxue (Chengdu Prefecture Academy, 成都府學) which was originated in BCE 141, but presently the university officially recognizes that it was established in 1896, the year when the Sichuan Zhongxi School (literally Sichuan Chinese and Western School, 四川中西學堂) which taught both Chinese learnings and western modern learnings was officially established (while it's actually opened in the summer of 1895). In 1902, Jinjiang Shuyuan, and Zunjing Shuyuan (尊經書院) which was established in 1875, the two Chinese classical learning schools, were merged with Sichuan Zhongxi School which was established in 1896 and was a new modern type school with studies from western modern learnings, and formed Sichuan University (Sichuan Daxuetang 四川大學堂) which soon renamed Sichuan Higher School (四川高等學堂). In 1916, four years after the ROC is established, with the merger of Sichuan Higher School and Sichuan Higher Normal School which was established in 1905, National Chengdu Higher Normal School (國立成都高等師範學校) was founded, and it was later divided to form National Chengdu University(國立成都大學) in 1926 and National Chengdu Normal University (國立成都師範大學) in 1927. In 1931, by the merger of National Chengdu University, Chengdu Normal University, and the Public Sichuan University (公立四川大學) which was formed in 1927 by merger of five Sichuan provincial specialized schools, National Sichuan University (國立四川大學) was established. By 1949, National Sichuan University had developed into one of the biggest national multidisciplinary universities with 6 schools, respectively in: literature, science, engineering, agriculture, law, and teacher training. After the CPC came to power in 1949, the National Sichuan University is renamed "Sichuan University" under the order issued by the Ministry of Education of the PRC, and, then, after the nationwide "adjustment of universities and colleges" (院系調整), the Sichuan University become a university with majors on art and science (which is called "文理綜合性大學"). The former Chengdu University of Science and Technology was established as the Engineering Institute of Chengdu (成都工学院) in 1954 as the result of the nationwide college and department adjustment, which was a part of formal National Sichuan University. It specialized in chemical engineering, hydroelectricity, mechanics, textiles, and light industry. Sichuan University School of Medicine was originally built as a private medical school, once known as Huaxi Xiehe College (West China Union College Chinese: 私立華西協和大學) and then West China University of Medical Science. It was established in 1910 by five Christian missionary groups from the U.S., UK and Canada, with offered courses in stomatology, biomedicine, basic medicine and clinical medicine. It has been a medical university in China that has enjoyed a good reputation abroad. Zhang Lan, social activist, educationist, and former Vice-Chairman of the Chinese Central Government, and Wu Yuzhang, revolutionary and educationist, were once the President of the university. Other notable people who studied at SCU include Marshal Zhu De, one of the founding fathers of the People's Republic of China and the People's Liberation Army, Guo Moruo, a literary expert and previous president of Chinese Academy of Science, and Ba Jin, a well-known Chinese author. Today, Sichuan University is the most comprehensive and largest university in Western China, and is part of Project 211. SCU grants doctorates in twelve main disciplines and 111 subordinate disciplines. It also has six professional degree programs, and has 16 disciplines for postdoctoral research. The 109 bachelor's degree programs SCU grants cover the main fields in liberal arts, sciences, engineering, medicine and agriculture. Its current student population is more than 70.000. Sichuan University has a current total staff of 11,357, among which 1,323 are professors, 2,345 associate professors, 13 academicians of Chinese Academy of Sciences and Chinese Academy of Engineering, 434 tutors of doctoral students, and 17 members of the Academic Degrees Committee and the Discipline Appraisal Group under the State Council. SCU has 23 professorships from the Yangtze River Scholar Award Plan (9 lecture professor). Jiang'an Campus of Sichuan University. In this photo we can see the Ming-yuan Lake and the 1st teaching building, the Jiang'an Library of SCU around it. Sichuan University has two national key labs, six national engineering centers, five ministerial (MOE) key labs, 35 provincial key labs, 10 ministerial and provincial centers, four key research bases for humanities and social sciences, and four clinical research bases at the national level. The university has invested significantly in research, teaching and medical equipment, with a total value of about 530 million RMB. SCU has undertaken and completed a considerable number of national, ministerial and regional research projects, and has made many achievements that are rated first class in China and bear significant international influence. The university publishes more than 4,000 research papers annually. In 2002, the university's state and central government funding ranked fifth among Chinese universities; it was ranked seventh for the number of publications and eleventh for publications included in SCI. The citations ranked fifteenth among Chinese universities. The number of publications in science, engineering and medicine ranked sixth, and the citations ranked seventh among Chinese universities. In 2002, the university applied for 121 patents, 102 out of which were invention-oriented, making it number eighth among peer schools. The university has four libraries containing, in total, about 5.5 million volumes. The libraries also serve as the Collection Center for English Publications under the National Educational, Scientific and Cultural Organization, MOE Information Center for Liberal Arts Literature and CALIS Southwest Sub-center. The National University Scientific and Technological Projects and Achievements Consulting Center, and Center for Medical Literature Retrieval in Southwest China are served by the SCU library as well. The university museum is the only one of its kind in China with a comprehensive collection of over 40,000 cultural relics, and over 600,000 animal and plant specimens, ranking first in its holdings among the others in China. The university stadium is fully equipped and served as the main field for the Sixth National Collegiate Sports Meet. Other sub-divisions available are Campus Web Center, Analytic and Testing Center, University Archive Establishment, University Press, National Foreign Language Examination Center and Intensive Language Training Center, four attached hospitals, and one attached health school. So far,[when?] the university has published 37 academic periodicals to domestic and overseas subscribers. 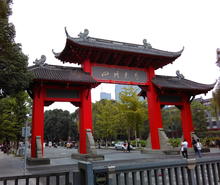 Sichuan University's three campuses are located in Chengdu, the capital city of Sichuan Province. The older Wangjiang campus (望江) is in central Chengdu, adjacent to the Jinjiang River and its tributary the Jiang'an River. The nearby Huaxi (华西) Campus is the site of the medical school. The Jiang'an (江安) Campus was built in 2003 in Shuangliu County about 12.5 km away from the older campuses; it covers an area of about 4.7 km² and has total floorage of more than 2.7 million m². New attending students (most of them) will spend their first and second year in Jiang'an Campus (the newest campus) and then moving to Wangjiang campus for the rest of their college years. The College of Physical Science and Technology is located in Wangjiang Campus. The Department of Physics was established in 1928. There are two key national disciplines: Atomic and Molecular Physics, and Nuclear Technology. Other study areas include Optics and Condensate Matter Theory. Condensate Matter physics carries out its research in the microscopic electron transportation lab. West China College of Stomatology, which has a significant role in the development of modern stomatology, and was the earliest hospital of stomatology in China. A dental clinic called Ren Ji Dental Clinic was founded in 1907, and then expanded to the first dental hospital in China in 1912. In 1917 the medical faculty of West China Union University (WCUU) established a department of dentistry and in 1921 the status was raised to the college of dentistry of WCUU. In 1928 the college of Medicine and dentistry formed the joint college of medicine and dentistry of WCUU. It was renamed as Hospital of Stomatology, Sichuan Medical College in 1953. In 1985, it was granted a name as the College of Stomatology, West China University of Medical Sciences and was changed into West China College of Stomatology, Sichuan University in 2000. Institute of Semiotics and Media Studies(ISMS), founded in 2006 by Professor Henry (Yiheng) Zhao. The ISMS has research focused on the semiotics of video games, brand, fashion, tourism, gift, celebrities and other topics of popular culture. Interdisciplinary studies integrating semiotics with Marxism, psychoanalysis, gender studies phenomenology, existentialism, hermeneutics, and post-modernism has been an ISMS focus. West China Medical Center of Sichuan University ranks 3rd according to http://rank2000.netbig.com/en/ and 7th according to china.org.cn. It also ranks at second place in Fudan University's list of China's best hospitals. ^ "学校简介 (EN)". Retrieved 11 July 2014. ^ "the history of the SCU" (in Chinese). SCU. ^ "ARWU World University Rankings 2017 - Academic Ranking of World Universities 2017 - Top 500 universities - Shanghai Ranking - 2017". www.shanghairanking.com. Retrieved 14 March 2018. ^ "QS World University Rankings 2018". 5 June 2017. Retrieved 14 March 2018. ^ "World University Rankings". 18 August 2017. Retrieved 14 March 2018. ^ "QS University Rankings: Asia 2016". 5 November 2015. Retrieved 14 March 2018. ^ "Asia University Rankings". 14 March 2017. Retrieved 14 March 2018.